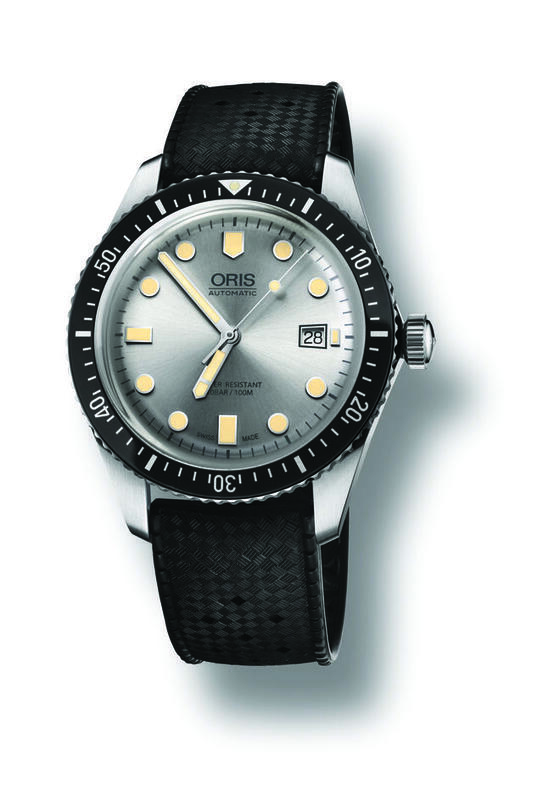 Oris made a splash a few years ago when it reimagined its distinctive 1960s diver to create the Diver Sixty Five. The watchmaker followed this success and demand with a larger-cased 42mm cousin. The watch has the same curved sapphire crystal as that earlier 40mm model, but offers a contemporary 42mm case and more dial color options, which makes it a strong competitor in the vintage-like diver category. 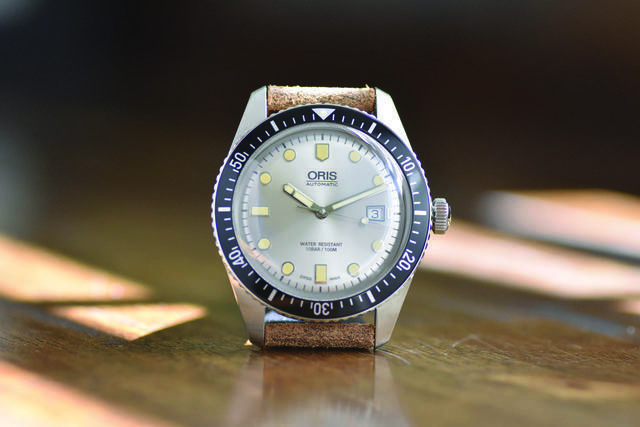 Oris has been around since 1904 and derives its name from a nearby stream in the Swiss town of Hölstein. Its offerings are neatly organized into four distinct collections, one of which is diving. 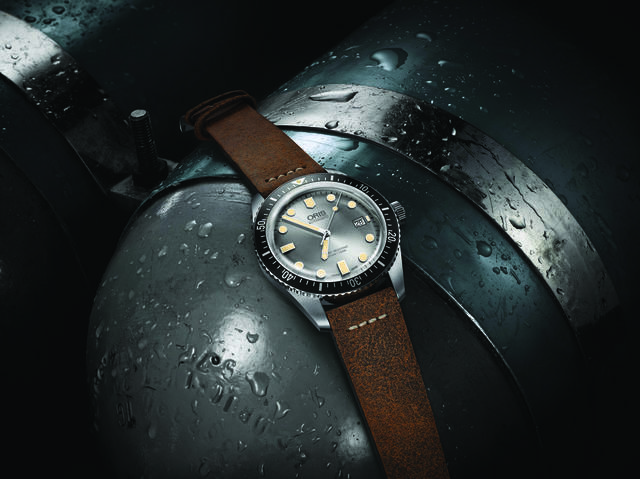 The Oris Sixty-Five shares the dive platform with the Oris ProDiver and Oris Aquis, but the Sixty-Five is seemingly aimed at the casual water watcher and not so much for the nitrogen-narcosis-fearing fellows diving off the Calypso. 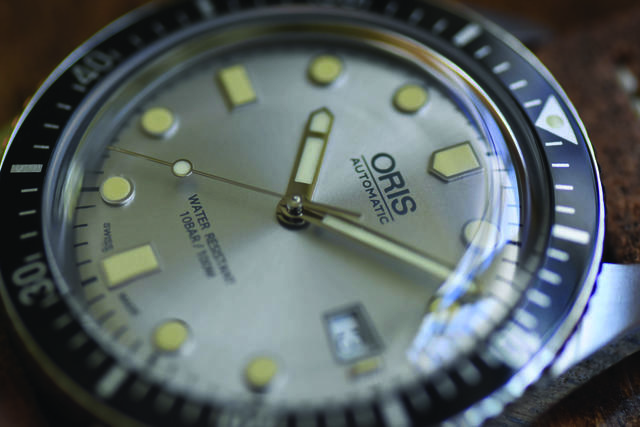 Oris Diver Sixty-Five is a low profile, modern-sized rendition of a classic diver watch using minimalistic design, curved sapphire crystal and aged-looking luminescence. 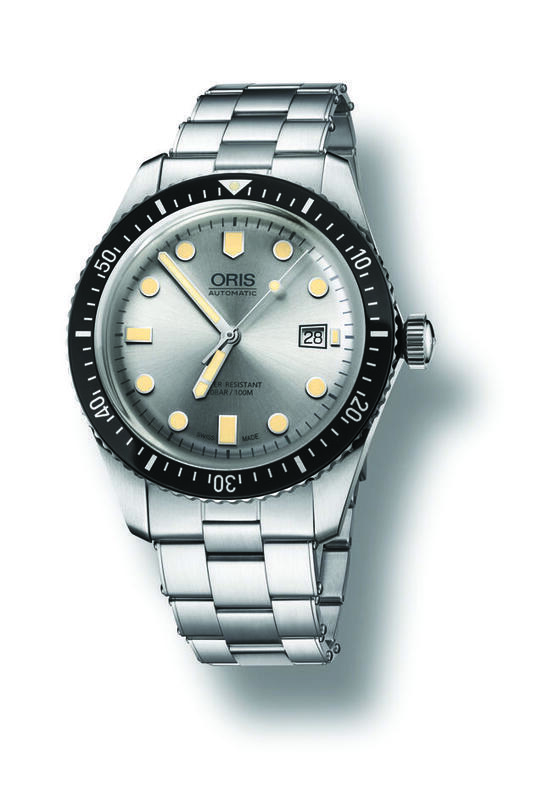 The 42mm wide stainless steel case represents the new normal for watch sizes and its lug-to-lug length is 51mm. It’s curved at just the right angle to hug my 7.5” wrist. The vintage-like leather strap is substantial; it sized simply for me with plenty of strap left and needed very little break in time. The Sixty-Five also comes in a steel bracelet and black textile or rubber straps. The case has an alternating finish with brushed lugs and polished sides and caseback. It’s a low profile case, but the curved sapphire crystal with anti-reflective coating adds height, thus it measures 14mm thick. Still, it wore well under a long sleeve and since it weighs only 87g, it was hardly noticed. The case is water resistant to 100 meters and comes with the screw-down crown. The steel, unidirectional bezel has that satisfying click I love to hear and feel as it turns around the dial. It’s easy to grip and the black aluminum bezel inlay gives clear contrast for each of the sixty clicks. There is a small, dot of lume on the triangle pip on the bezel, and it adds enough lume to orient your low light inspection, but the lack of lume on the rest of the bezel may give the serious tool-watch user some pause. The movement in this watch is a mechanical mainstay in Swiss watchmaking and will be around for a while. 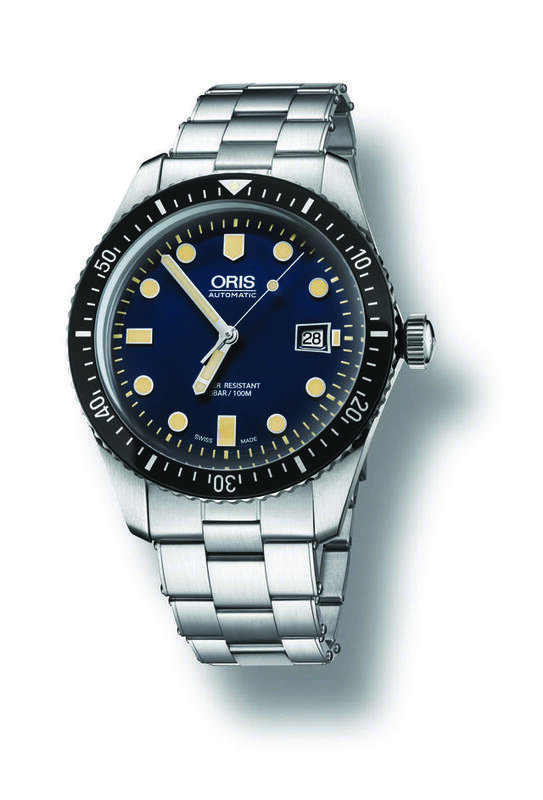 The Oris Cal. 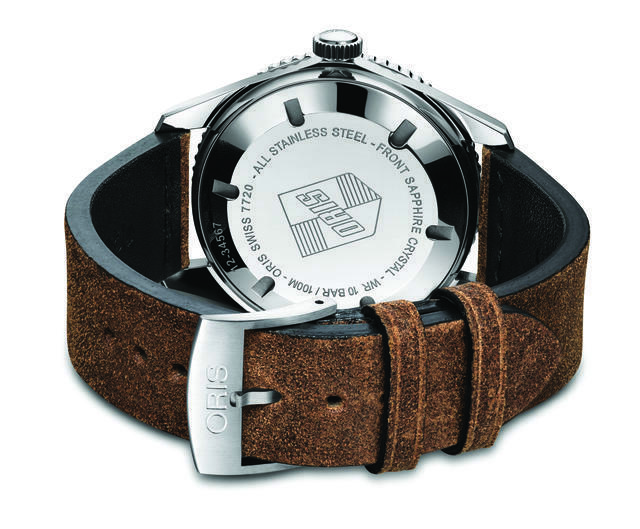 733 is a modified automatic Sellita SW-200-1, which is modeled after the ETA caliber 2824. It has the typical time only, center seconds, date window and hacking feature that allows you to stop the sweeping seconds hand to precisely set the time. The automatic movement has a standard reserve of thirty-eight hours and hums along at a reputable frequency of 28,800 vph. The signed, screw-down crown unscrews with ease and clicks into the hand-winding mode quickly. From there, it’s one more click to set the date and another to set the time. The case size and movement all point to a well-designed dial. 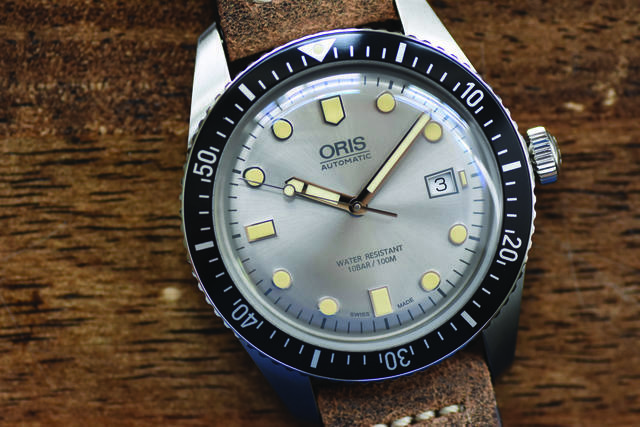 The stunning silver version has an off-white luminescence that feels aged without trying too hard while the thin, black Oris logo and water resistance rating remain submissive to the dial’s simplistic intent. The hour and minute baton hands are filled with SuperLuminova and are the ideal shape and length. The hour hand has an added aluminum bridge creating a separate space for the lume while the minute hands align with the outer chapter ring as it should. The sweeping second hand is easily tracked in light or dark with a luminous circle hovering over the dial. The applied indices are a perfect proportion and shape and come to life in the dark. The trapezoid date window at 3 o’clock is such a subtle design nuance that the die-hard diver may never notice the window shape framing the black Arabic numerals on the white date wheel. If there’s room to improve, then it might be in the dial color options, the stainless steel finish or perhaps a 40mm case more reminiscent of early dive watches. Despite these subtle suggestions, this watch has an understated sophistication to its case and dial colors. It does this on a foundation of a tried and true movement, curved sapphire crystal and the strap and bracelet options for any occasion. This watch and its cousins should continue to be on your radar as its value, style and legacy are hard to beat at $1,990.